The Kingswood Oxford varsity girls tennis team is off to a fast start, with wins in each of its first two matches. The Wyverns (2-0) defeated the Kent School, 6-3, in a competitive Founders League match on Wednesday. The Wyverns then won three of the six singles matches with wins by Chin, Smith, and Chalikonda. “It was a great team effort,” KO coach Ron Garcia said. The Wyverns opened the 2019 season with a convincing 7-0 victory over Hamden Hall on Monday. 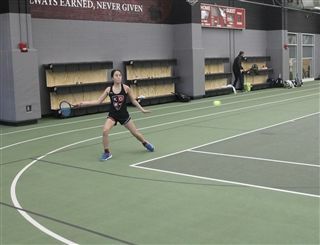 Kingswood Oxford got singles wins from Chin, Baron, Zheng, and Raymond while the doubles teams of Smith & Chalikonda, Izzy Rome & Amrita Natarajan and Esha Kataria & Jenna Blocher were also victorious. The Wyverns continue their opening home stand on Friday when they host Pomfret. Kingswood Oxford then faces Choate Rosemary Hall at home on April 17 and is at Hopkins for its first road match on April 22.